“Regret drug life that made me loose a child” (sic.) Just one small piece of Pittsburgh’s baggage. It’s a strange weight to carry–both metaphorically and very literally. The worn, shiny metal case (it was built to carry roller skates) is painted with a series of intriguing messages. A quote from Kate Tempest: “That thing you weep for, leave it,” and one from Carl Sandburg: “What is this load I carry out of yesterday?” The ends of the case have the instructions Got baggage? Leave it here. The Orbit encountered this unique piece of luggage attached to the arm of one Daria Sandburg who has been toting it through our fair city streets, to events and happenings for a couple years now. 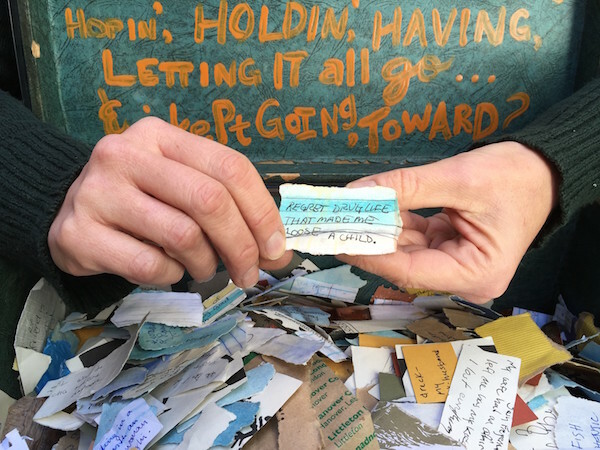 Sandburg honors every one of the case’s painted instructions with an invitation for whoever accepts to leave their messages (“Pittsburgh’s baggage”) in the form of short hand-written notes on scraps of multicolored paper. A separate, smaller inset box contains “possibilities,” which people are equally encouraged to submit. Ask nice and Sandburg will convert your hand-written note into cut, stamped metal. Over the last year, hundreds have taken Sandburg up on the offer. The baggage claim tickets cover the full gamut of guilt, regret, fear, and much much more. Markers of love and love lost, admissions of poor choices, addiction, and anxieties of every shade are stowed in the case. And while there’s a level of repetition and predictability to many of the entries, the format of one real human having submitted her or his expression in their own hand, in person, directly to Sandburg’s protective case makes each one unique, special, and often tragic. Even the most prosaic of messages–Being forgotten or My ex or Uncertainty–somehow carry a greater weight when you know the author was right there, among us. Logically, we know everyone has these feelings, but somehow it’s hard to accept, or to believe. The volume of tickets expressing some level self doubt is staggering. When the claims get deeper, more personal, they can be outright devastating. Take my lies, one reads, or My father’s suicide, or Letting where I missed be the measure of my life, or She was abused, now he’s dead. 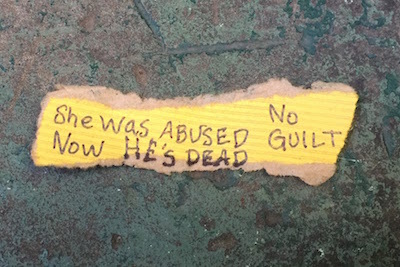 No guilt. It’s good the slips are so small or these could turn into major therapy sessions on both ends of the paper. 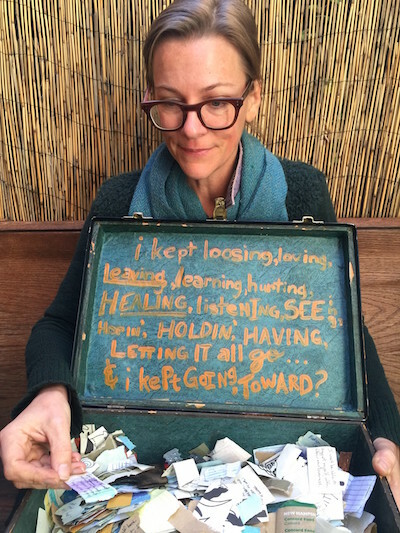 Daria Sandburg and her open case of Pittsburgh’s baggage. All told, it’s a heavy load to carry around. I asked Sandburg if she feels the project, open-ended and unresolved by design, could, ironically, become her own personal baggage. Could she be trapped under the weight of needing to collect and store ever more of the limitless pool of strangers’ personal issues? The response was remarkably upbeat, positive, and forward-looking. She doesn’t feel married to either the suitcase or the project, especially after the completion of a recent show combining the baggage claims with Sandburg’s original art (inspired by the submitted claims) at Boxheart. [The project required a greater-than-normal commitment to baggage collection.] But at the same time, there are no immediate plans to suspend her regular forays out with the box. One of Sandburg’s by-request hammered metal claim tickets. Sandburg is leaving soon to take the case out for a week-long working/collecting trip to the greater Art Basel Miami (and its associated shows/events) for that annual art/schmooze megalopolis as part of Boxheart Gallery‘s travel team. [Boxheart is participating in the alternative Fridge Art Fair.] There, she’ll be collecting South Florida’s baggage, and yes, mixing it with our own. This blogger predicts more regrets around taking on extra calories or the perils of imperfect abs and less decades-old nightmares around the Mark Malone and Bubby Brister regimes. But maybe we’ll find out that everyone really has the same baggage, even if Miami’s comes well-tanned and wrapped in vintage alligator. 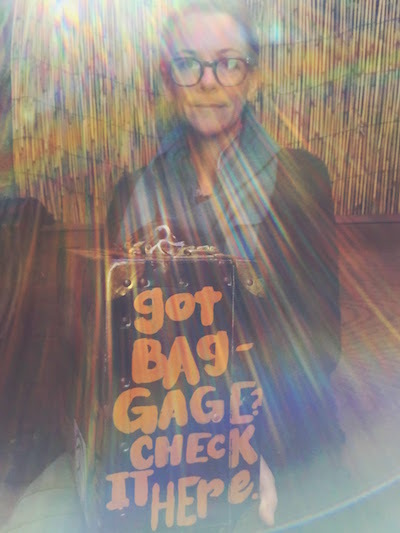 Follow Daria Sandburg and the Baggage Claim project on Twitter and/or Instagram for regular updates on incoming claim tickets–or just look out for the lady with the cool hand-painted metal case. 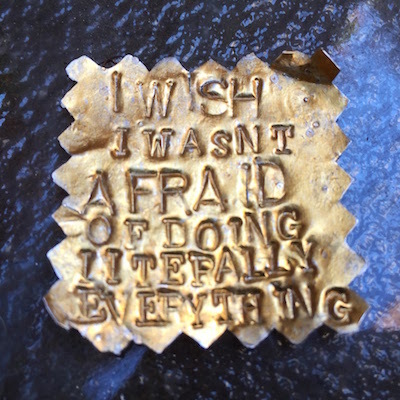 She encourages meeting interested strangers: “Happenstance is what really makes the project wonderful.” If you do spot her, say hello, and maybe consider leaving that thing you weep for.